I won’t rant for too long about the great Sham that is Comcast, but remember the big HD TV transition? With Comcast you “didn’t need to do anything”, right – nothing except get some set top boxes for each TV in your home if you wanted to retain the same programming. Oh – and you only get one for free with most cable plans. Long story short, I found out with this set top box I didn’t get HD channels, yet my other tv with no set top box did get HD channels. THE COMCAST BOXES BLOCK HD CHANNELS BY DEFAULT! Why? So they can up-charge you $$$ to upgrade, essentially, pay extra money to remove a filter on their boxes. 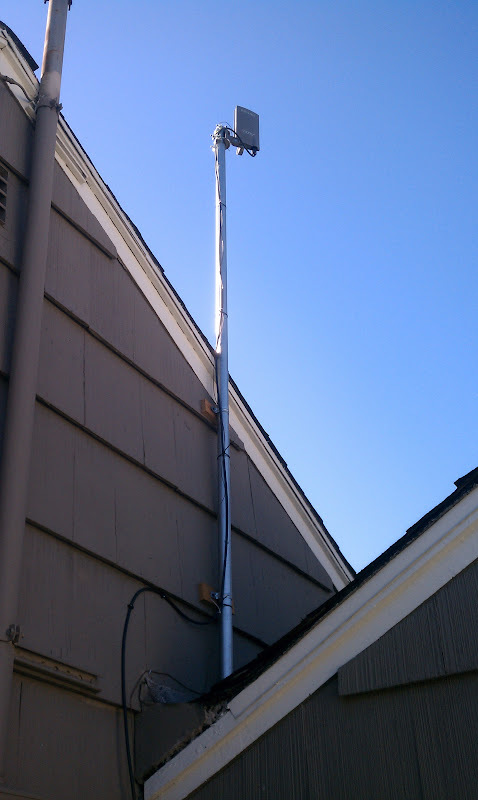 The Antenna I bought was cheap, outdoor, and had a nice swivel mount for direct mounting to the side of a house, on top of something, or pole mounting. Turns out 1 1/2″ EMT conduit is really cheap, light, and sturdy. 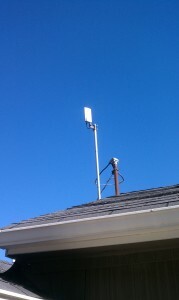 I decided to go big and get it just above my power service mast. 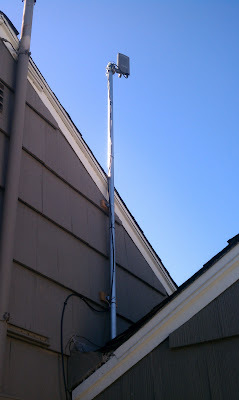 Location was chosen based on the existing cable entering the house at that location, easy to mount by getting onto the garage roof, and it will be with all the other tall stuff attached to my house. As soon as you try to home run your own cable more than once, you’ll desire good tools, so you can be slick like the Comcast man. That Paladin set has been worth every penny, because did you know you can use Coax for signal cable too? Now you’re a home theater master. In a passing conversation about HD Antennas, someone at work clued me into the fact I want to make sure I ground it properly. Something I figured the coax cable would take care of, but once you bolt a 8′ pole to your house that is now the highest point of your roof, its a good, easy idea. I just bought a length of 14AWG bare copper wire that runs from the top of the pole with the cable to the house, then takes the most direct route to my existing home electrical ground conveniently placed near where my cable enters the house. 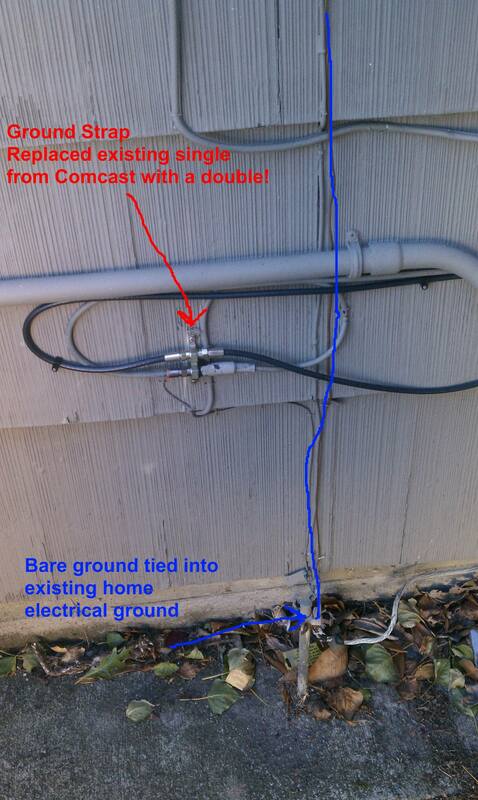 The Comcast cable already had a single ground block for the coax, which had a ground wire also connected to the home ground. This was an easy swap out for a dual ground block. From there the cable enters the garage to where it gets Amped and distributed through the house. 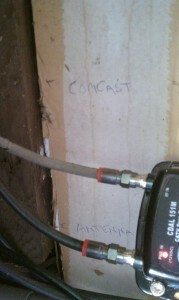 Comcast also installed a signal amp to help with my internet and TV signal. 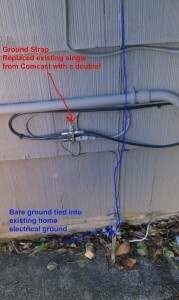 This is also helpful and usually recommended for HD Antenna installs. So now in the garage, I have a Comcast line, and my Antenna line coming in the same spot. This makes it really easy to plug and play between the two for troubleshooting, and whenever else in the future. The results were OK, most channels come in fine, however a few don’t come in well at all. I have a feeling some alignment is probably necessary, that and getting my wife sold on the nuances of OTA cable. Overall, its a success and if I had more time id figure out the alignment, or buy a better antenna. Also, http://www.antennaweb.org/ is actually an awesome resource with the information you’d need and want about OTA Stations, strengths, and locations in order to determine optimal antenna, placement, and alignment. 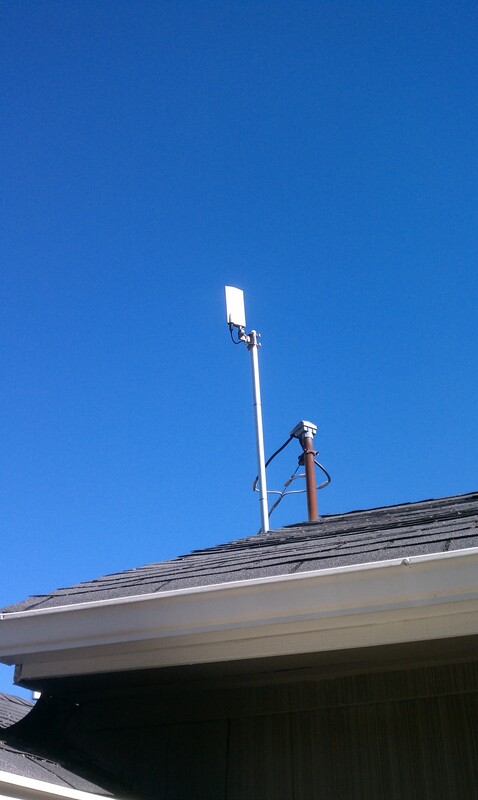 we used some of your tips, along with the site kickoutcable.com to get our antenna up and working. The picture is way better than what the cable company could deliver! We are so happy, and saving money!! !